A few weeks ago I created yet another CSS theme for the C2F web site. 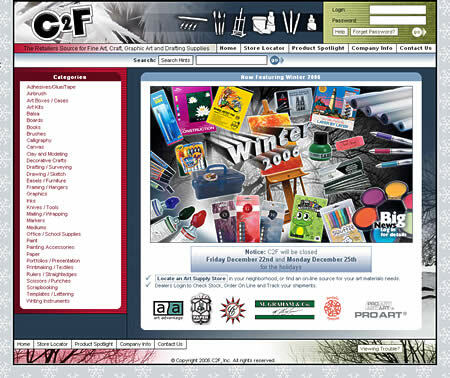 This layout was mostly a rearrangement of graphics contained in the Winter 2006 Promotional Catalog. It's fun to have a project where I am encouraged to create seasonal themes. I have artistic freedom to style it as I please - though I usually model it after promotional catalogs produce by our in-house art department for marketing sensibility. My hope for Esotropiart has always been the same - to be able to switch layouts and/or color schemes on the fly. Maybe one of these days I'll get it done. Other design projects have taken priority over my own site lately. Since working on these C2F themes, I have come up with a very nice way of structuring the files. Instead of having css and images folders under the root, I create a themes folder. Inside this folder are subfolders for each theme. For example, summer2006, holiday206, and winter2006. All the controlling CSS files and images to make up the layout are stored there. So when it comes time to change themes, all I have to do is point the external CSS link in the header to a different folder. Pretty slick - and very easy implementation. This time I made a minor change to the XHTML source, moving the product search box to a prominent place on the top. Here is a sample of what the Winter theme looks like. For a better sampling, visit the C2F web site - but soon, before the next theme hits!